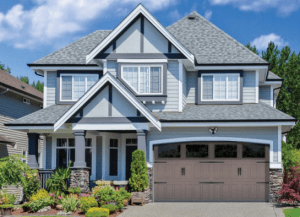 Performance Building Products proudly sells, installs, and repairs Wayne Dalton Garage Door products. Contact us today if you’re in need of commercial or residential garage door services. Wayne Dalton is excited to introduce the new 9510 Designer Steel with the Vicksburg design. A garage door with the high-end looks of a carriage house door, with the durability of steel sections. 1) Large, Bold Sections –> The 7’ tall door will stack with three (3) 28” sections. With these large sections, the embossments have been maximized, so the rail height is a similar ratio to the 21/24” sections. 2) Impressive Window Sections –> Not only do the windows encompass the full size of each “trio” of embossments, but the window frame is streamlined, and uses window divides, rather than inserts, to increase the amount of open light area by 20 sq/inches, compared to other steel doors. 3) Carriage Looks and Low Maintenance –> The large sections provide a look that is rarely seen on a full-steel embossed door, and with a painted solid steel front, the customers will not have to worry about needing to re-finish their doors. 4) Pinch-Resistant Joint and TorqueMaster ® –> By combining the patented section joint, and torsion solution, this product continues the tradition of providing the homeowner a door that is safe and durable. 5) R-Value of 12 –> The 1-5/8” thick polyurethane section provides thermal performance that will make it a suitable door for most climate zones, as the sections not only provide the insulating needs for most applications, but are also less susceptible to thermal bowing in climates than other doors.